It doesn’t feel much like spring at the state Capitol, with all the gray skies and above-average rainfall we’re having. 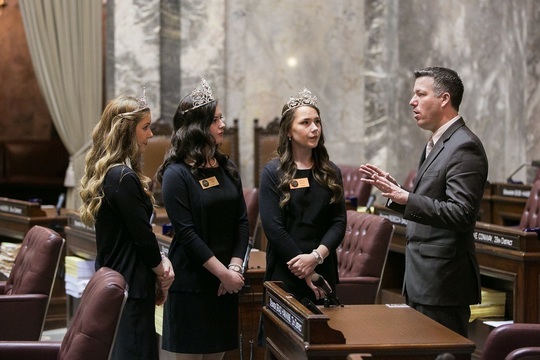 That’s why I was especially glad to host this year’s Apple Blossom Royalty in Olympia this week. Just the words “Apple Blossom Festival” make me think of orchards, fields, the smell of blossoms – and our usual warm, sunny weather back home. 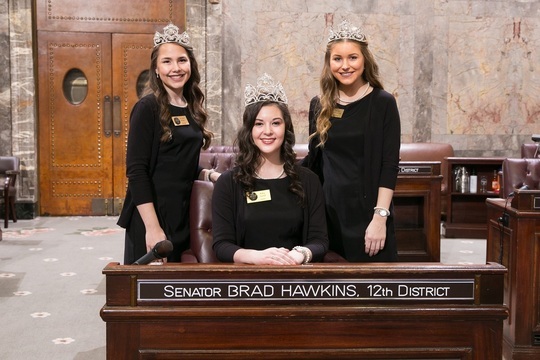 I appreciate how the Washington State Apple Blossom Festival sends its royalty as ambassadors to locations and events throughout the state (including our Legislature) to promote our traditions and agricultural heritage. It was an honor for me to sponsor the Senate resolution honoring the Apple Blossom Festival (scroll down to see the formal resolution) and a great pleasure to get to know this year’s Royal Court: Queen Amy Sand, Princess Alissa Riker, and Princess Paige Chvilicek. 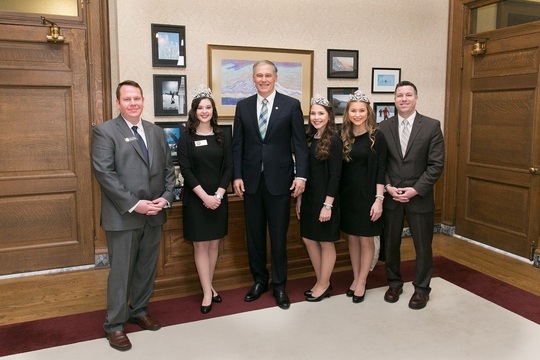 This year the queen and princesses met with Representative Steele, Representative Condotta, Secretary of State Kim Wyman, and Governor Jay Inslee. I also appreciated being able to introduce a group of such bright and graceful young women to many of my legislative colleagues, as representatives of our region. To top it off, the ladies proudly distributed Aplets and Cotlets throughout the Capitol. Once again, the Royal Court’s visit to Olympia included the debut of their “royalty song” about the festival. This year it’s to the tune of a recent Justin Timberlake hit -- click here to enjoy the video of their performance. I also interviewed the queen and princesses in the Capitol Rotunda about their day at the Capitol and the Apple Blossom Festival; click here for the video. Among the highlights of the day was the time spent with Secretary of State Kim Wyman. One member of the Royal Court registered to vote while she was at Secretary Wyman’s office, and two pre-registered – which state law allows for 17-year-olds who will turn 18 by Election Day. It’s rewarding to see young people showing such interest in their state government. 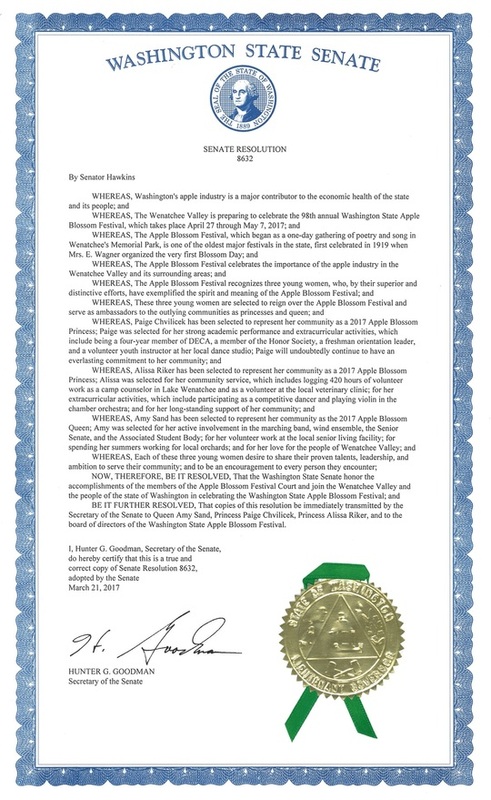 I enjoyed being able to host them and appreciate everyone in the Wenatchee Valley who sponsors and supports the Apple Blossom Festival. The 2017 festival, which goes from April 27 to May 7, will indeed be "Awesome Blossom"!